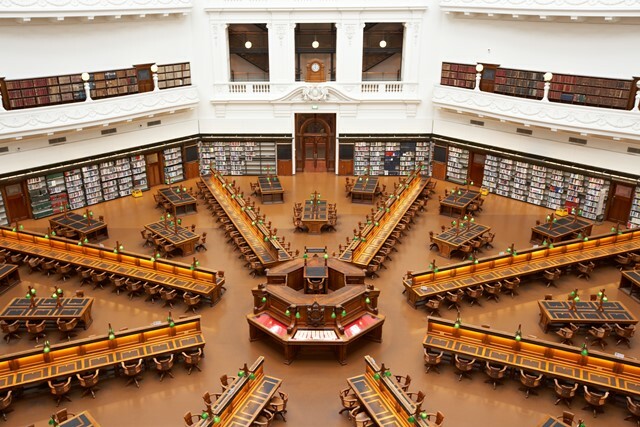 State Library Victoria has welcomed significant new funding announced last night by Minister for the Creative Industries, Martin Foley. The Victorian government has increased the Library’s funding by $5 million per year to allow the Library to continue to support the social, creative, educational and economic aspirations of the Victorian community. Minister Foley also announced the full funding of a second state-of-the-art off-site storage facility in Ballarat as part of Creative Victoria’s $23 million Collection Storage Victoria Project. This is a critical second stage of the Library’s long term storage plan which currently sees over 50% of the collection stored off-site in Ballarat. The new facility will ensure the Library can safely accommodate its ever-expanding collection and continue to make it readily accessible to Library users. President of the Library Board of Victoria John Wylie said he was delighted with the announcement. State Library Victoria is Australia’s oldest free public library and the nation’s busiest with nearly 1.8 million visitors a year – more than the British Library and the Library of Congress in Washington. In 2015 the Victorian government committed $55.4 million towards the Library’s $83.1 million redevelopment, Vision 2020. The five year project combines government and philanthropic funding to refurbish and renew Library spaces, create new digital and entrepreneurship centres and an e-Town Hall initiative to connect regional public libraries throughout Victoria. The redevelopment will also reopen the public entrance to State Library Victoria on Russell Street, create new exhibition spaces and new education and learning facilities for families, children and young people. It is due to be completed in 2020. State Library Victoria CEO Kate Torney said the funding announcement is very good news for the Library. “This is a terrific budget outcome for the Library and most importantly, for the people we serve and we are grateful for ongoing government and philanthropic support for this important cultural institution,” Ms Torney said. This is great news, where can I find out more about the ‘new digital and entrepreneurship centres and an e-Town Hall initiative to connect regional public libraries throughout Victoria’ ? I’ve just noticed that we’ve lost one, no, two little words from the name of our library: ”the” and ”of.” Checking back I see that we lost them about a year ago. Did they simply drop out of sight one quiet night when nobody was looking? Or did the Library Board debate the pros and cons? Did they have a focus group? Did someone commission a survey? Was the name change formally announced and I missed it? Could you please tell me why and how the State Library of Victoria became State Library Victoria? Hi Angela, well spotted. There were rumours they got lost in the stacks one night, but you’re right, it was a little more planned then that. While not officially announced, we dropped ‘the’ and ‘of’ in line with our new brand and website in November 2014. We have changed our name before, from the Melbourne Public Library to the Public Library of Victoria (1944) then to the State Library of Victoria (1960). As a legal entity we are still the State Library of Victoria so we may see ‘the’ and ‘of’ back on-shelf again someday.